I love these shots. 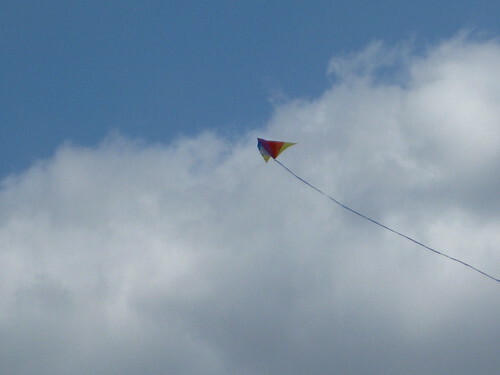 Flying a kite is so much fun once you get it in the air. Congratulations on your upgrade - it takes great shots! That first one is absolutely beautiful; I'd be tempted to frame it and put it up on the wall to remind me to have fun once in awhile as that's what kites are all about. WooooHoooo a new camera! I really like these shots - I especially like the contrast of the kite's colors against the sky. Too funny - I was just thinking the other day that I should go get a kite and take it down to the beach! Happy Belated Birthday and congratulations on the new camera. I love these colorful kites against the blue sky with fluffy clouds. I love my Nikon D60 and I'm sure you'll enjoy your Canon Power Shot too. Thank you for the comment on my blog! We have TWO gates up! Also, belated happy birthday! 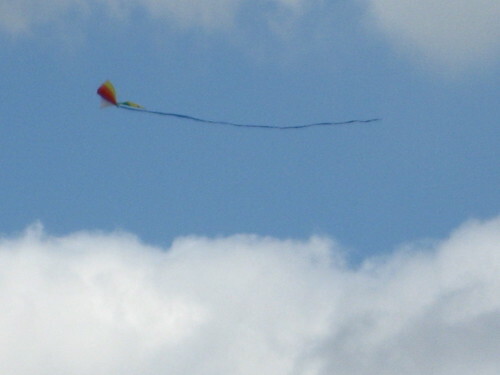 i havent flown a kite in years. i want to now! Beautiful photos! A new camera. That is some gift from your husband. I'm a little late in visiting everyone's photos but I'm glad that I'm finally getting around to it. These shots are just great!